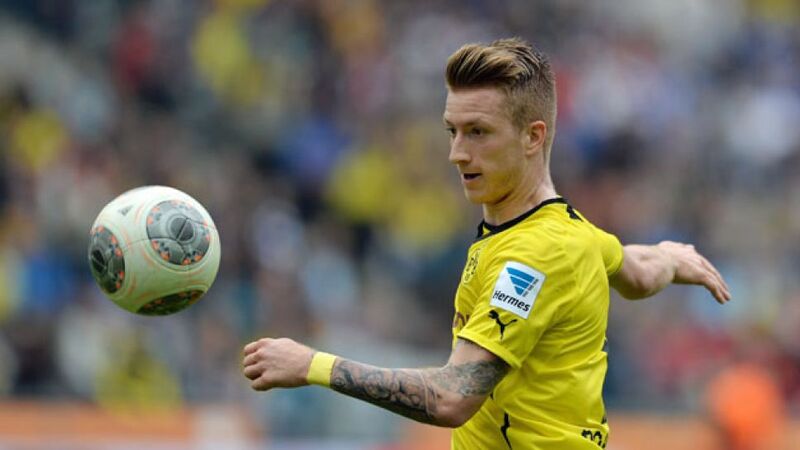 Duisburg - Borussia Dortmund attacking midfielder Marco Reus has been voted Bundesliga Player of the Season by his top-tier contemporaries. The 25-year-old Germany international (26.8 per cent) scooped the prize ahead of BVB team-mate Robert Lewandowski (20.3 per cent) and FC Bayern München winger Arjen Robben (10.1 per cent) after scoring 16 goals and chipping in with 14 assists over the course of the 2013/14 campaign. FC Augsburg's 12-goal winger (20.3 per cent) Andre Hahn, meanwhile, saw off stiff competition from Dortmund left-back (15.3 per cent) and FC Schalke 04 midfielder Max Meyer (13.4 per cent) to take the award for Newcomer of the Season. The Best Coach accolade also landed in Augsburg arms, with Markus Weinzierl (30.7 per cent) pipping Bayern's Pep Guardiola (25.6 per cent) and Dortmund head honcho Jürgen Klopp (18.6 per cent) to the post after guiding the Fuggerstädter to a surprise eighth-placed finish and within a point of a place in the UEFA Europa League qualifying rounds.